Apparently, two of the states I drove through, Iowa and Minneapolis, rank 2nd and 4th, respectively in power generation in the country. I wish that more of the farmland could be turned multi-use: for growing crops to feed us and generating energy to power us. That is such a superficial description though. 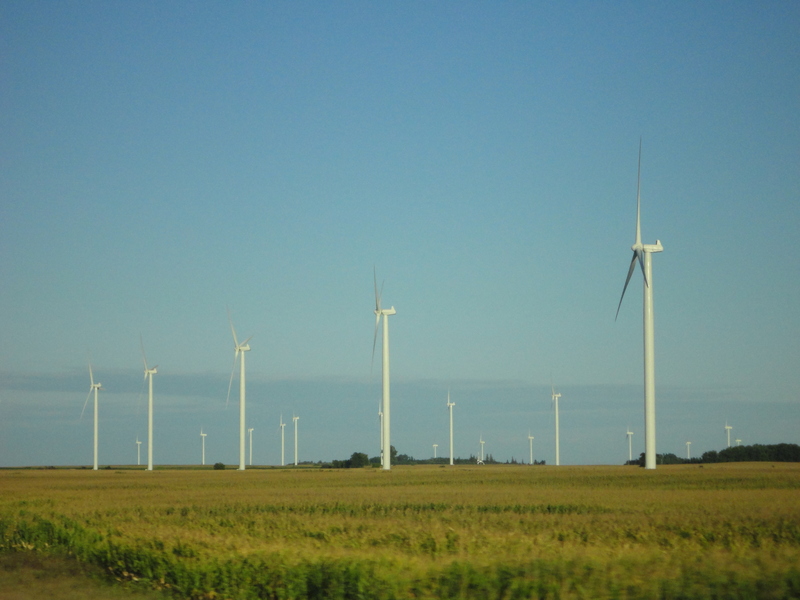 My father, who works in utilities, told me that a decent number of wind turbines will never pay for themselves. Because their lifetimes are in the range of 20-30 years, deviations from ideal conditions can cause power outputs to fall below expectations. The irony here is that sustainable energy initiatives seem unable to be economically sustainable themselves. But then, I decided to search around some more for wind turbine facts, and found various places (here, here, and here, to name a few) stating that they can pay for themselves in as little as 6 years, and then start making a profit! Now, that makes me wonder why wind is one of the heaviest subsidized energy sources by the government. If there is profit to be made in a reasonable time period, why aren’t private investors jumping on board to finance wind power with their own dollars, instead of taxpayer dollars? Maybe I’m missing some explanation for this, and I would appreciate hearing an answer. It’s confusing, because on one hand, advocates for wind energy say that it can pay for itself, and even generate a profit, but then, they are asking the government for support. That’s not to say I’m against alternative energy sources such as wind power. I believe that climate change is a real problem concerning our future, and that reason alone seems like enough to justify government funding. But when advocacy groups start to sell it as a good deal, they’re just misleading the public. It takes away from why we should really care about alternative energy: so that there can still be a livable Earth in a few centuries. All this talk about wind “paying for itself” only opens wind energy up to criticism from its opponents that they can skew as an argument against all wind energy itself. I think that wind energy advocates would serve themselves and the public some good if they were honest about the costs, and instead, focused on the real long-term benefits (and when I say long term, I mean many generations, not just the 20-30 year lifespan of a turbine). But if there really is some good explanation for why wind energy is both a smart investment and something the government must get involved in, please do let me know. Or rather, an explanation why a smart investment cannot gain enough funding from the private sector. I’m all ears. Does paving roads give any net benefit to society? How do the costs of laying down fresh asphalt compare to the benefits of better fuel efficiency (in theory), safer roads (in theory), and civilian comfort? Because if the net benefit were positive (or even slightly negative), it would be a great infrastructure jobs program. Iowa was remarkably mild in political messaging, at least in the portion I drove through (basically IA-27). It consisted of Cedar Rapids, Iowa City, and … Waterloo (hometown of our favorite Republican presidential aspirator). 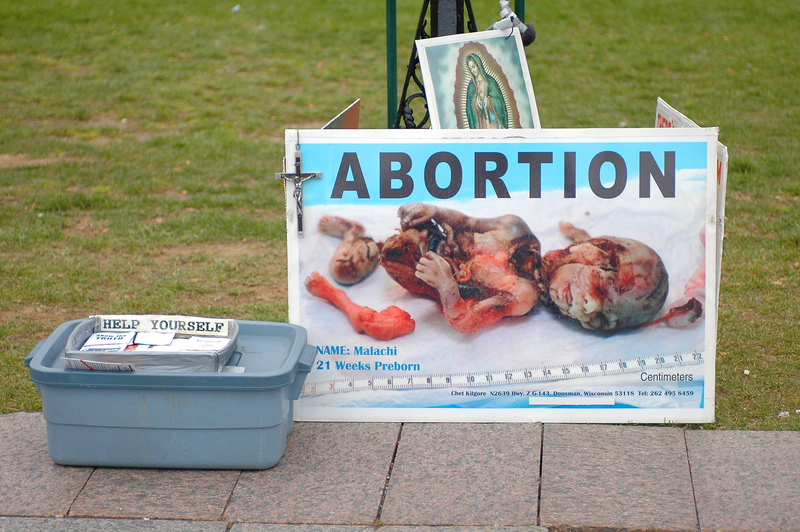 The only thing I saw was a sign saying, “Smile, your mother chose pro-life!” which pales in comparison to something like this (a little graphic).